Welcome to The Suncook Valley Sun Newspaper! It is well documented that after John Cram established his saw and grist mills at the foot of Factory Hill, he erected a home on the top left hand side of the hill above and brought his family there in 1770. 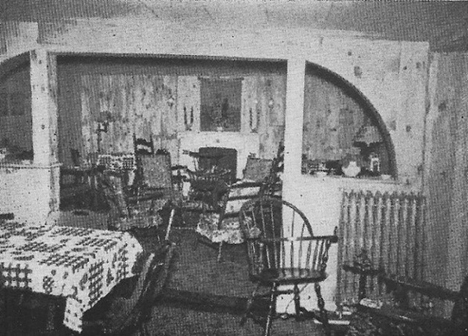 It was a large, two-story, unpainted house with small windows. While in his possession it not only served as his house but as the town’s meetinghouse, a place of vendue, a school house, and a tavern. When Mr. Cram passed away in 1803, the property went to his son John Cram, Jr., and in 1817 he sold it to James Joy who had purchased the Cotton Mill. Mr. Joy repaired and enlarged the building. Its next two owners were Philip Rogers and Enoch Watson, followed by Grenville Remick, who first named it the Washington Hotel. Mr. Remick sold it to True Garland in 1863. Mr. Garland was a stage driver most of his life. He retained the property for two years and then sold it to Horace A. Perry who owned the property for only 10 months before selling it to Charles C. Sanborn. Mr. Sanborn was born in the Pittsfield area in 1845 and married Mary Meserve 20 years later. Surely there was a great scandal when Mrs. Sanborn filed for divorce in 1873 on the grounds of his adultery with Annie Brown. The divorce was granted in October of 1874. In 1866 Mr. Sanborn erected a two story piazza on the building which greatly added to its beauty. The work was done by Captain Albert C. Evans. (Picture 1) He sold the property to Levi Robinson in 1867 who held it for only 10 months before selling it to Andrew J. Sherburne. He owned it a mere six months before selling it to Thomas B. Tucker. Mr. Tucker retained the property until 1878 and then sold it to Henry C. Gale. Mr. Gale married Martha Haywood and had one child, Adelaide, who married George E. Kent of Cotton Mill fame. In 1884 Mr. Gale made extensive interior improvements, freshly papering and painting the rooms. He changed the name of the hotel to Gale’s Hotel but after he sold it in 1886 to Luman D. Marston, it was changed back to the Washington Hotel. Mr. Marston became the first long-term owner since James Joy at the beginning of the century. Mr. Marston was born in Chichester in 1848. Prior to purchasing the hotel, he was its stable keeper. He resided at the hotel until July of 1911 and then moved to his farm on Concord Road, commonly referred to as the Park Place. Mr. Marston was heavily involved in the horse trading and racing business. In 1892 he purchased the old Academy Building on Park Street, moved it to his farm adjacent to the Fair-grounds, and converted it into a stable for harness horses being trained on the adjoining race track. In 1907 he introduced gas for lighting the hotel. 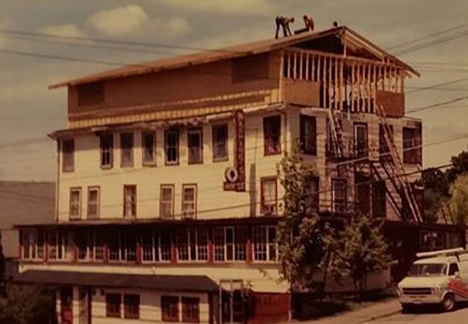 By the first decade of the Twentieth Century the hotel had fallen onto hard times. For the next several years ownership was short, the hotel was often closed, and the bank had to intercede at times to reclaim the property for unpaid mortgages. The first time was in 1913. The following year it was sold to Henry L. Foster. He left town in October of 1917 and apparently the hotel closed. It was being repaired in August of 1919 after having been closed “for a long time,” and reopened in mid-October. 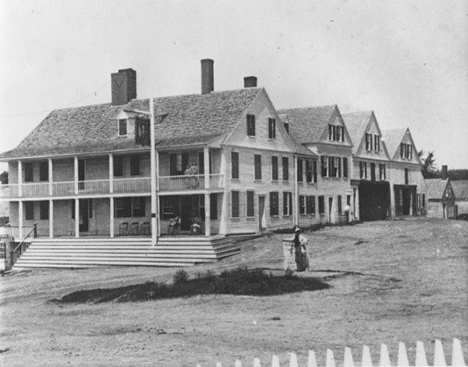 Then in late 1922 and early 1923 the hotel was closed again for several months. The bank once again interceded, repossessed the hotel, and sold it in May to Joseph L. Hussey who in July enlarged the dining room. 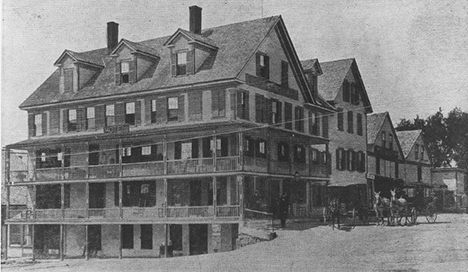 On November 1, 1925 the hotel closed for the winter. However, the Husseys returned home from their vacation in Tampa, Florida in February and opened the establishment earlier than expected. Mr. Hussey passed away at the end of August, 1926, and his wife Minnie became owner. She died the following year, and her executor, Carroll Paige, turned the property over to the Pittsfield Savings Bank. Later that year it was sold to Gates S. Murchie. In 1930, Mr. Murchie added hot and cold water to many of the rooms, and placed baths in some of them. Many were newly painted and wallpapered. 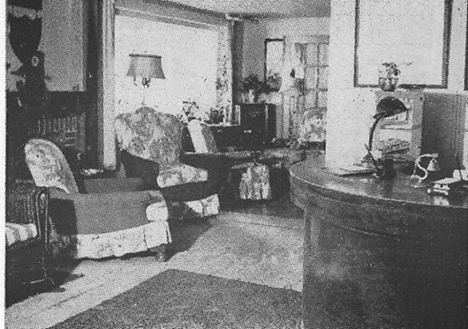 The lobby was redecorated with rose colored walls and rugs, and provided with ebony chairs and writing tables. Mr. Murchie was the first of a series of short term owners. The property was owned consecutively for no more than four years each by William Darling, Emilie Darling, Fred Ayers, William Thickens, and once again, Gates Murchie. In 1939 Mr. Murchie sold the property to Richard Stilson who owned it for the next eight years. Mr. Stilson was born in Cobleskill, New York in 1887. Initially an accountant, he turned to a career in the hotel business. After arriving in Pittsfield he became an important part of the community. During World War II he served as vice chair of War Bonds sales, was district director of the United States Air Force Warning System, and served on the War Price Rationing Board. He also chaired the local chapter of the Red Cross and Infantile Paralysis Drives, and was president of the Chamber of Commerce. 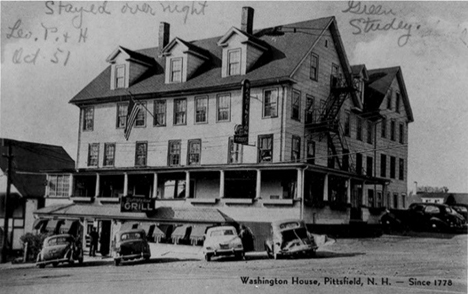 He represented Pittsfield in the legislature 1943-46, and was president of the New Hampshire Hotel Association. 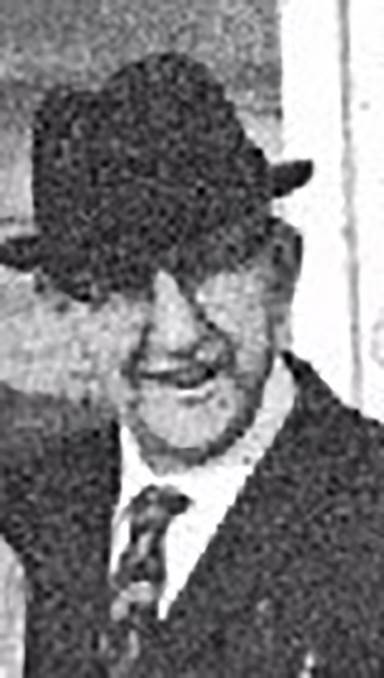 In 1947, Mr. Stilson sold the property to Daniel MacDonald. He renovated and opened three new rooms for public use. 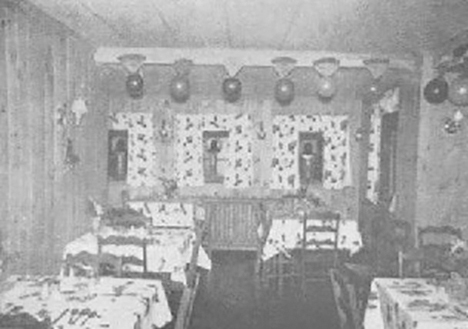 The walls of the “Colonial Cocktail” room were covered with knotty pine boards. Grouped around an attractive fireplace were quaint ladder back, rush bottomed, arm chairs. Scattered around the room were groups of cricket arm chairs and love seats. At the time the Drouins purchased the property, they were living on a 580 acre farm in Gilford. They initially hired Hervey Guay to manage the establishment primarily because Raoul had no formal education and could not read or write. Yvonne had only gone as far as the eighth grade. After about a year they let go Mr. Guay and brought their daughter Theresa home from Florida to help run the business. The hotel [had a] grill and dining room, cocktail lounge, banquet room, large lobby and a large apartment (where my parents lived). 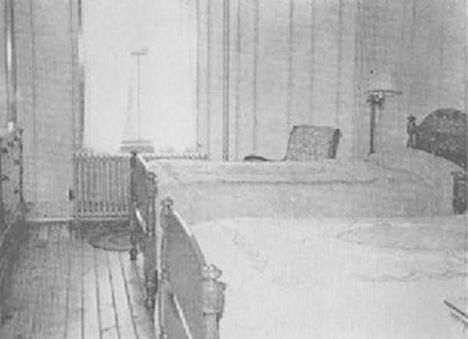 There were 40 rooms; some had 4 double beds, only 3 or 4 rooms had single beds, and several double and twin bed rooms. All the rooms had a comfortable chair, desk and sink, with hot and cold water, and all were heated by forced hot water. We had rooms that the floor boards were 32 inches wide and 28 feet long. On the third floor several of the beds were brass. The hotel had two showers, one in my parents’ apartment and one in a common bathroom area on the 3rd floor. Six or seven rooms had tubs in them and one tub was located in the common bathroom on each floor as well. The hotel also had a large walk-in cooler to store whole sides of beef. All of the work was done by the family. Theresa did all of the laundry, except the bedding, which was sent out, and all of the ordering and bookkeeping. Many of the guests came to town to visit the local mills. Some workers stayed at the hotel from Monday through Friday noon, taking their meals there. Many of the seasonal apple pickers stayed at the hotel as well. All of the local clubs used the banquet and meeting rooms. 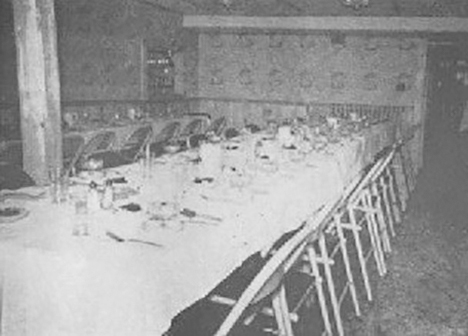 Christmas parties, showers, weddings, and bowling banquets were held in the hotel, and many groups used the facilities. 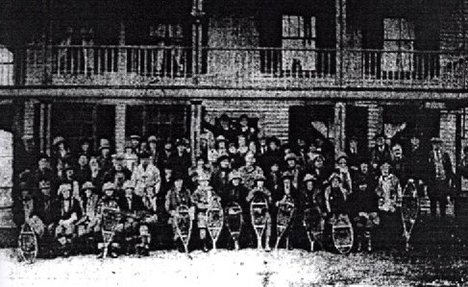 Large events also attracted guests: the Deerfield Fair, the Sled Dog Races, and the fall deer hunting season. At those times the hotel would be full. Another attraction was the large screen (for the day) television in the lounge. Customers would drink and watch Uncle Milty, Perry Como and other popular shows. Sometimes bands from Boston were hired to play on Saturday nights, drawing large crowds to dance and drink. In the morning during hunting season it was nothing for Theresa to cook two cases of eggs, plus bacon, ham, sausage, and pan fried potatoes, all before 7:00 o’clock. During Thanksgiving Theresa made 50-100 meat pies and even more at New Years. It was nothing for her to make 30-40 salmon pies with creamed egg sauce. During the holidays they cooked complete dinners for families in the local area who had many invited guests but did not have the facilities to do so. On a weekly basis they sold 26½ barrels of draft beer, at 10¢ for a 12 ounce glass. They also sold 50 cases of beer at 35¢ a bottle, plus liquor. The Hotel had several famous guests. Bob Cousy came in for a few beers and talked French with Mrs. Drouin, often bringing in several basketball players with him. Grace Metallious of Peyton Place fame spent many an afternoon there. Mrs. Robert Frost, the poet’s wife, stopped by and often took Mrs. Drouin to Boston. The biggest change during their ownership was the installation of the Route #28 bypass in the early 1960s which ended almost completely the Hotel’s transit business. This contributed to the decline of the establishment in the following years. In 1971, Mrs. Drouin, her husband having passed away that year, sold the property to Burley and Theresa Brock, and Theresa’s brother Pasquele “Pat” Perrino. Mr. Perrino was born and raised in Belmont, Massachusetts and later worked in such prestigious hotels as the Parker House, the Mettersill, the Arlberg, the Statler, and the Yankee Fisherman. He continued operating the hotel until selling it to Diana Busby in 1980. By this time the building was in serious disrepair. 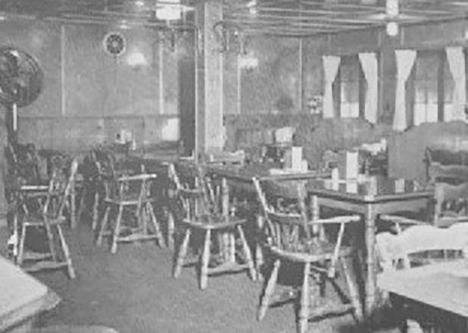 After Mrs. Busby became owner meals were no longer served, organizations did not make use of the premises, and most of the guests were relatively permanent, low income residents. In July of 1984 the building caught on fire and left 21 people homeless. It was nearly destroyed but Mrs. Busby, not to be deterred, began restoring the building. She installed a new top floor and undertook some rehabilitative work on the others. Nonetheless, it was a losing cause. In 1990, six years after the fire, the town took the property for back taxes, and the following year John Witham tore it down. (Picture 12).